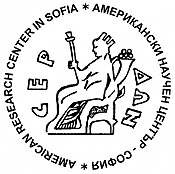 The American Research Center in Sofia (ARCS) was established in 2004 as an organization dedicated to facilitating academic research in Bulgaria for North American scholars and collaboration between scholars from North America and countries in Southeast Europe (Albania, Bulgaria, Kosovo, Macedonia, Montenegro, Romania and Serbia). A principal aim of ARCS is to foster research and collaboration between North American scholars and those in Southeast European countries, formerly deprived of access to Western scholarship. Albania, Bulgaria, Kosovo, Macedonia, Montenegro, Romania and Serbia share a remarkable historical heritage and strong cultural ties. Sofia is well situated intellectually and politically as host city for an international research institution; inasmuch as it has not been directly engaged in recent troubles between countries of Southeast Europe, and is relatively centrally located, it has a great potential to provide an intellectual setting for careful and unbiased assessment of Southeast Europe's past. The intellectual community thus realized should become a significant resource for overcoming some of the longstanding ethnic and national problems in the region. Browse all titles by the American Research Center in Sofia.